MANY people reported having seen what was probably a meteorite over the west of France last night. Images of the actual sighting are few and not of good quality in media and social media this morning (ours shows a previous one), however people have spoken of seeing a coloured light in the sky between about midnight and 1.00 today. Some say it looked green or blue, another spoke of red balls, turning to yellow. Some compared it to fireworks. 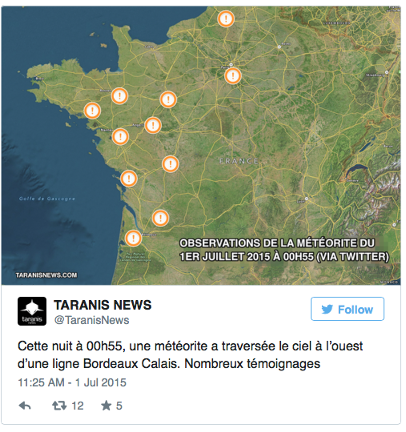 Sightings were between about Rennes and Bordeaux, and news site Taranis News tweeted a map. One of the staff from the Nantes Planetarium, Linda Brouard, told Ouest France it was probably a meteorite and was likely to have been due to a comet passing close to the sun and disintegrating, causing dust which catches fire in the atmosphere and makes luminous trails.